Long dismissed, this one city’s design gets the credit it’s due in a new book from MIT Press. From its inception in 1941, the Strip has mutated beyond even its own wildest dreams. In the 1940s, Strip developers dressed like cowboys, some packing real guns, built hacienda-style casinos that broke ground with moving neon displays as big as windmills. 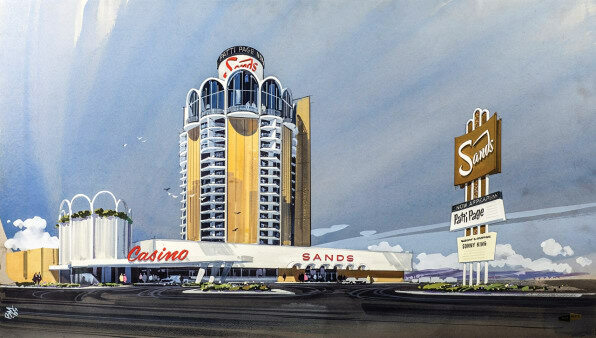 By the 1950s, casino builders replaced the wagon wheels with Cadillac tailfin forms, and pumped underwater Muzak into exotically shaped pools. The 1960s neon signs, as tall as 20-story buildings and as long as two football fields, were ripped down in the 1970s when the emphasis shifted to the buildings themselves, and chandeliers the size of trucks. By the next decade, the chandeliers had been replaced by a 10-story, laser-eyed sphinx and a fiery volcano spewing piña colada scent. Charmed by the world’s famous cities in the late 1990s, Las Vegas built replicas, including the Eiffel Tower, New York skyscrapers, and Venetian canals. But in the new millennium, a mere decade later, replicas were out and serious architectural originals, which housed museum-quality collections of authentic art, were in.